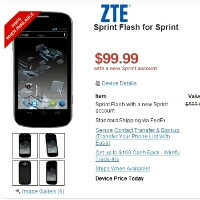 The ZTE Flash handset for Sprint we were tipped about ten days ago, is now official over at Best Buy and Wirefly. The specs list coincides with what our tipster sent this way - a 4.5" IPS-LCD display with 1280 x 720 pixels, 1.5 GHz dual-core Snapdragon S4, 1 GB of RAM, 8 GB storage, 4G LTE, microSD support, and 12.6 MP camera. Sounds pretty high-end, and the pricing is not bad either - $99.99 on Wirefly, $149.99 on Best Buy, which fits our rumor hint of $130 about in the middle. Best Buy currently has it in "sold out" status, whereas Wirefly will ship it "when available". The off-contract price with Wirefly is $479.99, which is pretty reasonable for the specs, but let's wait and see what the complete review will be saying. How come on screen keys in pic but the specs page has capacitive? Also, this is essentially my dream phone size wise. But ZTE?... we'll see. The screen itself is capactive in nature so having on-screen keys doesn't make the keys not capacitive, in my mind. a couple reasons why someone would get this instead of the Lumia 920: 1) They have Sprint, which at this time is not getting the Lumia 920. If they want that phone they have to switch carriers. 2) Its android instead of WP8. A lot of people still aren't sure about Microsoft's new OS, whereas Android is considered familiar to many people. Anyway, got word from work that this phone apparently has been delayed slightly.